"I boutght a DVD from Southeast Asia on a trip and found it not playing on my DVD player (US). I know it restricts playback of some DVDs but how many regions are there and is there a drive that supports all regions." "Whenever I try to run a DVD I get a note 'Your system is set to region 2. to play this DVD set your system to region 4'." The explanation of DVDs from different regions has been highly urged among movie zealots. Given this, we share this article that focuses on DVD copy protection and guides you to remove DVD region codes with the aid of region free DVD player. Additionally, it introduces DVD region free software to help you convert region 1/2/3/4/5/6 DVDs for limitless playback whether you are travelling in U.S, Europe or China, without taking along discs. If you are just going to disable the region codes on DVDs for unlimited playback, there are programs, such as region free DVD player, DVD region killer, DVD backup software, you can count on. ▶ DVD Ripper/copy software - Generally, downloading or buying a different DVD player or region killer for each region setting isn't the most practical solution. For example, many users complain that VLC player won't recognize the DVD because of wrong DVD region codes, other copy protection measures or leads to choppy playback of DVD. Whereas such region coding of a DVD can be circumvented by making a copy with DVD copy software that adds flags for all region codes, creating an all-region DVD. 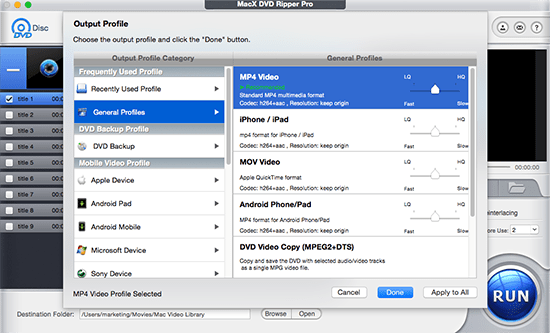 MacX DVD Ripper Pro is just the one standing out from other similar DVD region free software . This program allows you to rip regional DVDs and make all DVDs region codes free instead of resetting DVD drive. It helps to decrypt regional-playback control encryption, remove Region-code enhanced (RCE) or other copy protection measures, like CSS, Sony ARccOS, Disney X-project protection, and more. The function is not limited to DRM remover, it is an all-region DVD copy/ripper software that helps to backup DVD with region codes to MPEG2, MKV, ISO image and rip DVD Mac from region 1 to region 2, or DVD to MP4, MOV, AVI, WMV, MPEG4, H264 etc. Whether you have region 1 DVD or region 2 DVD, you can play them on your iPhone, iPad, Android, even you are abroad. Note: For the DVD players that aren't region-free, it's easy to unlock your DVD player via remote control. You can find your DVD unlocking code and over 5000 DVD player unlocking hacks from Videohelp site and even double-check for negative comments to change the factory-set configuration flag to another region or the special region free/0. ▶ DVD Region Killer - Another approach to bypass the region coding is to take advantage of the DVD region killer or DVD video recorder software. However, such program doesn't work with PRC-2 drives. DVD region codes are a digital rights management technique created to enable motion picture studios to control the worldwide release of their movies, including content, release date and price, based upon the region. To be specific, region-free discs will play on any player, irrespective of the country. But for the region-locked DVDs, they are unplayable on the DVD player sold in other regions. Note: Discs that bear region 0 (commonly referred as region free) or region all means they are uncoded and can be played worldwide. But for the PAL-formatted discs, please make sure you are using a PAL-compatible unit to play the discs. While similar to PAL, NTSC discs are playable in an NTSC-compatible unit. As it is mentioned above, DVD Players and discs are identified within a specific geographic region in the world. A DVD from region 1 is only playable in the DVD player originated from region 1. The same is true for region 2,3,4,5 and 6. For instance, the region 1 DVDs are only playable in DVD players purchased in the U.S. or Canada. The region 2 DVDs won't play in a standard DVD player you bought from Mexico. So it's advised to take a look at the region code on the back of the DVD package and be sure the DVD you're going to purchase is compatible with your DVD player. Consequently, for movie lovers who live in USA but want to play DVDs from Europe, Japan or countries other than those of region 1, to change the regions becomes top of priority. So how to overcome DVD region code, change DVD from region 1 to region 2 or make the DVD region free? Moving on. 5. Select the Region in which you'd like to change to and hit OK. Note: the Region Code cannot be changed, even though the OS is reinstalled or the DVD Drive is moved to another PC. 2. Consult the DVD package to verify the code. MacX DVD Ripper Pro is an all-region/region 0/region free DVD decrypter Mac that can copy and rip DVD even encrypted with region code enhanced, not to mention the region 1,2,3,4,5,6 DVDs. Step 1: After download and install the region free DVD ripper, run it and insert a regional DVD, click "DVD Disc" button. Please turn to Windows version if necessary. Step 2: Choose an output format based on your needs. With 300+ output profiles, you can convert the region encoded new DVD movies to any devices, like iPhone SE/6S/6 Plus/7/7 Plus/8/X, iPad Air 2/Pro, Samsung Galaxy S9, PS4, etc. Step 4: Hit "RUN" button and start to rip copy protected DVD. After that, the converted DVD is region free and playable on any media player. And if you wanna play videos on iPhone iPod iPad, you can use MacX MediaTrans to transfer video from computer to iDevices.